After 13 years of multi-platinum hitmaking and box-office tour rankings, there is little to suggest that Irish pop group Westlife is slowing down. HOW fast time flies. It has been 13 years since pop group Westlife began as a bunch of Irish teenagers in Dublin, brought together by pop impressario and X-Factor (Britain) judge Louis Walsh. Boyzone singer Ronan Keating was also roped in to co-manage the band with Walsh. Yet after 10 albums and 44 million sales into its career, the need for a career change became a pressing one. The Westlife lads – Nicky Byrne (32), Kian Egan (31), Mark Feehily (31) and Shane Filan (32) – came to a crossroads last year. Rather than sticking to the same winning formula that had produced 14 British No.1s and best loved hits (Swear It Again, Flying Without Wings, Unbreakable, etc), it was perhaps time to tear themselves away from their comfort zone, shred the rule book and start again. The quartet’s 11th offering, Gravity, released late last year, saw the Irishmen sail into uncharted waters, wrestle an unprecedented level of creative control and most critically of all – start believing in themselves again. While they were still selling millions on the back of predominantly cover songs and love ballads, they had to confront some painful truths about how much creative steam they were lacking. They realised they needed to bring back some originality into their output. So with a new American producer John Shanks (of Bon Jovi, That Take, Miley Cyrus fame) on hand to assist, Gravity saw the lads flex songwriting muscles that had been little employed over the previous decade. Well, certainly not since the group’s third album World Of Our Own (2001), where they co-wrote half the album. “Yes, it’s a great album (we feel). It’s definitely another step forward for us, especially the original songs,” said Egan during a phone interview from London on the eve of a landmark appearance at the BBC Proms in The Park in Hyde Park and just before embarking on the Africa-Asia leg of this year’s Gravity tour. The group is set to delight local fans with a concert at the Putra Indoor Stadium, Bukit Jalil in Kuala Lumpur, on Oct 7. The upcoming visit to Malaysia will be Westlife’s fifth visit to the country. Back to the recent album, Egan reckons it has a good mixture of tunes and blend of genres. “There are some great variations on the album, some up tempos and some mid tempos. We worked with producer John Shanks, and he gave us a really big sound to the album,” he added. But rather than promoting a slew of singles as they have done in previous albums, just the one single – the British and Irish Top 10 hit Safe, was released in October last year. And after parting ways with their record label – the Simon Cowell owned Syco – early this year, they’ve since stuck to promoting and touring the album for the most part of this year. The past has been highly eventful but looking ahead – making music and touring – is the mission for the Westlife lads. “As we’ve become more mature over the years as Westlife, it’s not necessarily about releasing a second or third single from one album. It’s more about the album and how it works as a whole. The world certainly continues then, for the guys, who came together in 1998 as a five piece. Brian McFadden left in 2004 to pursue a solo career. Each member is now just over 30 years of age, and still “feeling great, to be honest,” as Egan puts it. Grateful, and ready to celebrate more of that success in the upcoming months. Westlife is set to release a 3-CD career spanning Greatest Hits deluxe package (Sony Music) come Nov 21, only the group’s second retrospective after 10 studio efforts. The band members, as noted by Egan, are looking forward to the release as a special “thank you to fans” who have supported them throughout their career. “We’re looking at a version with 34-35 songs on it, and there’ll be the single Greatest Hits CD version with just the main songs that have been the bigger hits over the years,” explained Egan. And the good news for fans is that there will also be new material on Greatest Hits, in addition to favourites such as Swear It Again, Flying Without Wings, You Raise Me Up, Home and more. It also means that there will be no let-up in touring either, with the Gravity tour which began in March in Cardiff, Wales. This current worldwide tour is due to be wrapped up by the end of the year, after the Africa-Asia leg. 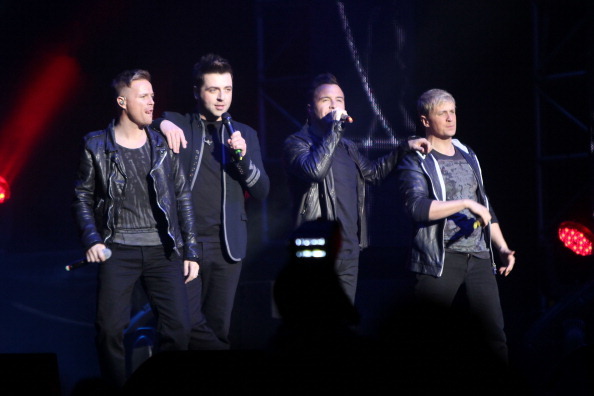 As much as the group enjoys life on the road, Egan paused and said that Westlife might take a few weeks off in December. But the Greatest Hits tour is pending and that should be a massive long haul adventure ahead. For Westlife fans here, it has been some years since Westlife set foot in Malaysia. Back in 2002, the group played a concert and held a football match in KL to coincide with its (first) Greatest Hits album. It was an eventful visit with Team Westlife beating the Malaysian Rockers United 7-1 in the Westlife Showcase and Soccer Extravaganza at the Bukit Jalil National Stadium. As Egan noted, Malaysia seems to have held a special place in the hearts of Westlife during the early years. When the Irish lads embarked on their first ever promotional tour in 1999, they visited Malaysia twice that year alone. For their second album, spearheaded by the smash remake of Billy Joel’s 1980s smash hit Uptown Girl, they returned for a concert in May 2001. This will be the first time Westlife is back in Asia since 2005 when the group visited China. With much enthusiasm, Egan promised a major concert experience ahead in KL next month. > Westlife Live in KL: Gravity Tour 2011 will be held on Oct 7 at the Putra Indoor Stadium, Bukit Jalil, KL. The concert is presented by JS Concert Productions in association with Midas Promotions. Tickets priced at RM358, RM258, RM158 and RM98 can be purchased from www.ticketpro.com.my and www.airasiaredtix.com or from Victoria Music, Guitar Store and Rock Corner outlets. For enquiries, call 03-7880 7999 (Ticketpro)/03-8775 4666 (AirAsiaRedTix).